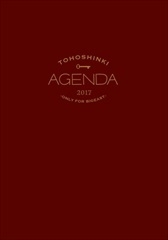 [INFO] 180220 The Release of Tohoshinki 2018 2 Way Calendar Announced! 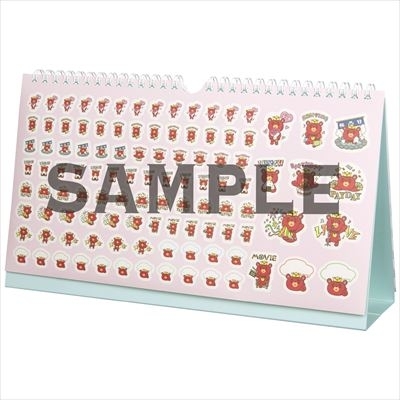 Available on mu-mo Overseas Shop! 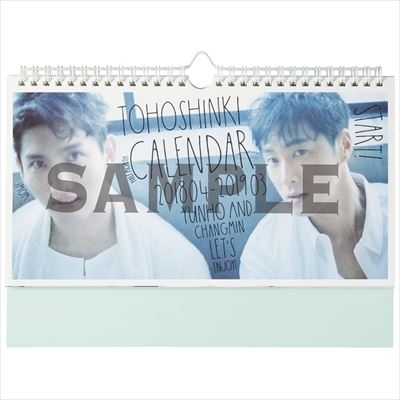 The Bigeast fanclub official website has just announced the sale of the Tohoshinki 2018 2 way Calendar for 2,900 Yen (Tax included), and it can be used in two ways: as a wall or a desk calendar! Bigeast members have the benefit of getting an “IC card sticker (with signature)” (All 4 are random)! 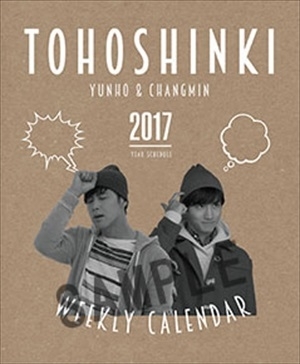 Similar to the one as announced for Japanese fans previously, foreigner fans purchasing above 150USD will qualify for the 2018 TVXQ Calendar present while stocks last this year. Tagged The Shilla Duty Free, TVXQ! 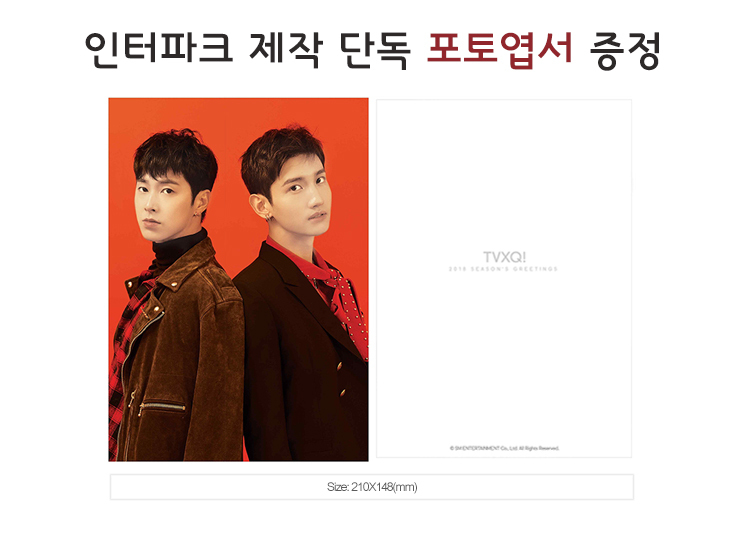 For purchases above 200USD, the 2018 TVXQ Calendar will be given as a present. 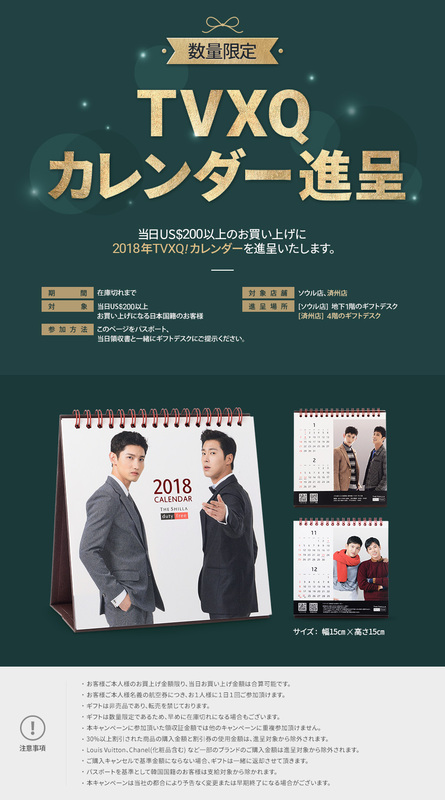 The event is marketed towards Japanese fans purchasing at Seoul, and this Calendar is the same as the one given during the last Shilla Duty Free FAN FESTIVAL with TVXQ! in SEOUL. Beside Synnara and Aladin, another store ‘Inter Park’ recealed their poscard gift with the TVXQ! 2018 Season’s Greetings set (Release 12/21). 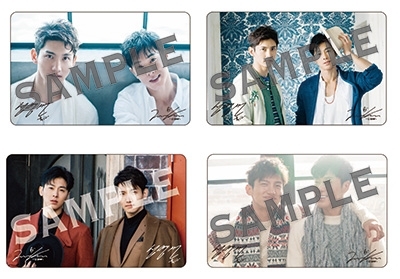 It seems there is going to be a polarid/poscard gift with the TVXQ! 2018 Season’s Greetings set (Release 12/21). Some online stores revealed photos of them (it looks like each store may have different benefit?). 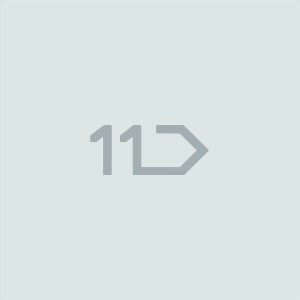 Tagged Autograph, Fan Event: 2017 THE SHILLA Duty Free Fan Festival with TVXQ!, TVXQ! 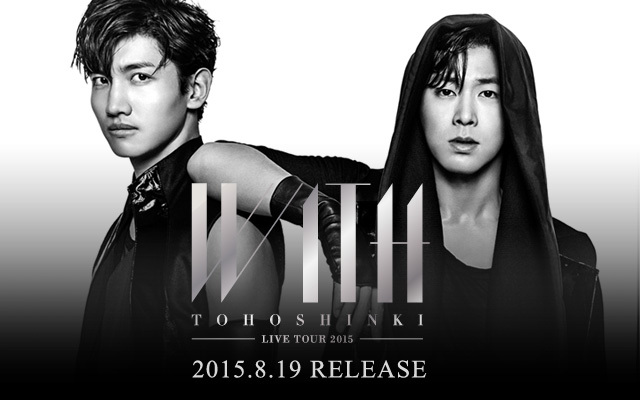 More preview photos of TVXQ! 2018 Season’s Greetings are out, and release date will be 12/21! 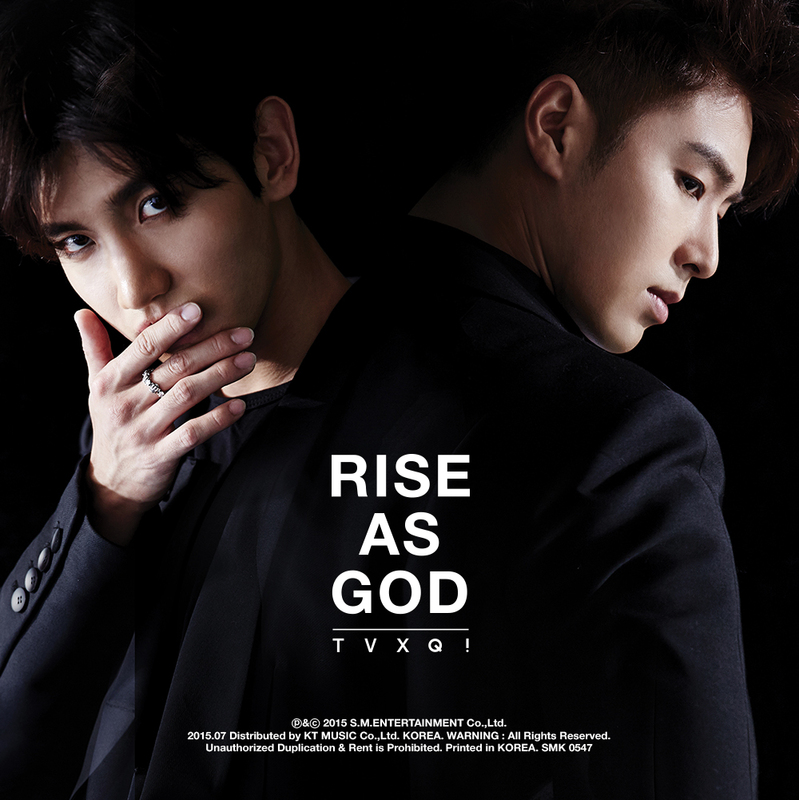 Preview photos of TVXQ! 2018 Season’s Greetings and a SUM event announced! Tagged Season's Greetings, SUM, SUM EVENT, TVXQ! 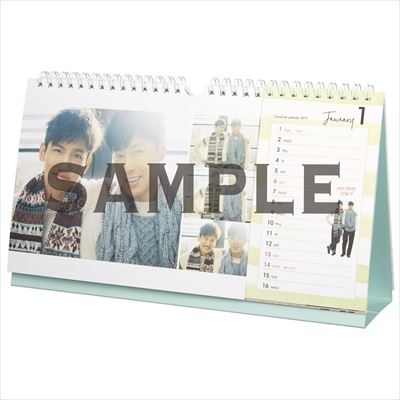 [INFO] 161219 The Sale of the 2017 Bigeast Limited Desk Calendar, Diary and Reversible Calendar has been Announced!! We may not be getting the 2017 season greetings, but luckily Bigeast fanclub official website just announced one~ ♪! A total of 56 pages (including cover page). It starts with April 2017 and ends at March 2018. A total of 176 pages (including cover page). It starts with April 2017 and ends at March 2018.